This Standard establishes minimum food protection and sanitation requirements for the materials, design, and construction of commercial food preparation equipment that is power operated. This Standard does not apply to manually operated equipment. This Standard does not contain safety requirements. Equipment covered by this Standard includes, but is not limited to, coffee grinders, grinders, mixers, pasta makers, peelers, saws, slicers, tenderizers, and similar equipment. Section 7 of this Standard pertains to food handling and processing equipment that has been designed and manufactured for special use purposes. Food equipment designed and manufactured with a security package is utilized in environments such as correctional facilities, mental health facilities, and some schools. 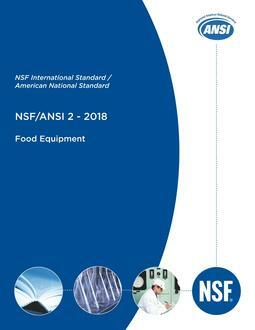 For these environments, where both sanitation and security are concerns, 7 contains exceptions to this Standard that shall only be applicable to the splash and nonfood zones of food equipment provided with a security package. Equipment components and materials covered under other NSF or NSF/ANSI Standards or Criteria shall also comply with the requirements within. This Standard is not intended to restrict new unit design, provided that such design meets the minimum specifications described herein.